Suicide isn’t a topic one might think would be worthy of a whole photographic exhibition. Particularly in Kenya where mental illness generally and suicide specifically are so imbued with taboos that whole families have been known to suffer when a single family member commits suicide. 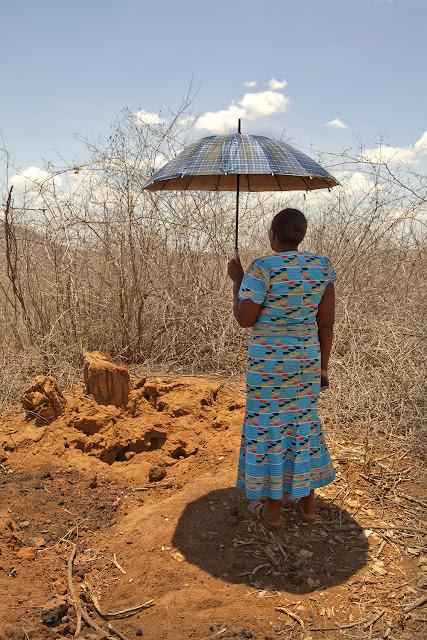 But Spanish photojournalist Patricia Esteve wasn’t deterred by the stigma often associated with suicide when she set out to examine the whole topic, ultimately to produce a multimedia exhibition like ‘Out of this Life: Let’s Talk Suicide’ which is currently up at the Kenya Cultural Centre gallery. A project that has taken her three years to produce, Patricia (who worked as a photojournalist with Spanish media before coming to Kenya six years ago) collaborated with several organizations and individuals involved with mental health issues in Kenya and Africa generally. The outcome of her initiative is to a show that is part ethnographic, part poetic and wholly grounded in the grassroots experiences of individuals, families and organizations that specialize in counselling Kenyans who are either suicidal or have first-hand experience with family or friends who’ve suffered the stigma of suicide. For Patricia’s photographs form only a portion of the showcase. She also shares a slew of hand-written letters from people she interviewed and asked to share their feelings about the issue. The letters fill a whole wall in the gallery, next to one photograph of all the local press clippings about suicide that she’s collected since her project began. She also created a video of three people she interviewed during last Thursday night’s (20th April) exhibition opening. “I interviewed more than three, but as I am working alone [photographically], I’m still working on the editing,” says Patricia who is hard pressed to explain why suicide peeked her interest as a topic to photograph. She initially says it was partly out of curiosity and not because anyone close to her had committed suicide. But then she admits she has a penchant as a photojournalist for doing projects on ‘marginalized’ people, be they homeless or drug addicted or people who’ve lost everything, be it family, money or social status. Then once she came to Kenya with her family six years ago, Patricia was struck by the fact that in addition to mental health issues being stigmatized, attempted suicide specifically is actually a crime, according to Kenya’s Penal Code. So while her show isn’t explicitly about human rights, her discomfort with the injustice of incarcerating the mentally ill contributed to her seeking out individuals like Sitawa Wafula, the award-winning blogger and poet who’s used the USD25,000 Google award to establish her website info@mymindmyfunk.com which offers free mental health counseling, not only in Kenya but around the world through TED talks and other public fora. Patricia also found organizations like Befrienders.org and Postpartum Depression Island (ppdisland.com) which helped her to make contact with people whose stories feature in the exhibition. 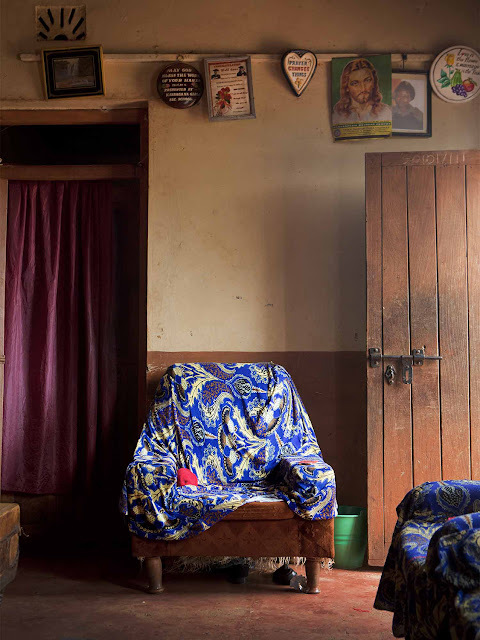 But Patricia’s photographs don’t only focus on individuals who attempted suicide, although there are several ‘survivors’ in the show, a number of whom she found through an NGO called ‘Users and Survivors of Psychiatry in Kenya’ (USPKENYA). One such survivor is Samoina who attempted suicide following the birth of her child and the depression that ensued. But Samoina was able to recognize her mental problem and go on to found ‘Postpartum Depression Island’ where she offers counselling to mothers afflicted with the same sort of depression that led her to try suicide. But Patricia’s also photographed the bereaved, including individuals like Neerah and Diana both of whom lost their best friends to suicide. She includes one image of a father’s suicide note as well as one of the church where he set himself ablaze. One of the most tragic stories that Patricia reveals in the exhibition is of the mother whose ten year old boy hanged himself after being reprimanded by her for not completing his homework. She doesn’t take a photo of the mother or the boy, only his favorite armed chair which the mother draped with one of her favorite kangas. She also took a shot of the garden where he was found soon after he died. The mother’s grief is unspeakable but the community’s judgment of her as well as the media’s coverage of it is painfully implied in the imagery. Not all of the storied photographs are as tragic as these. 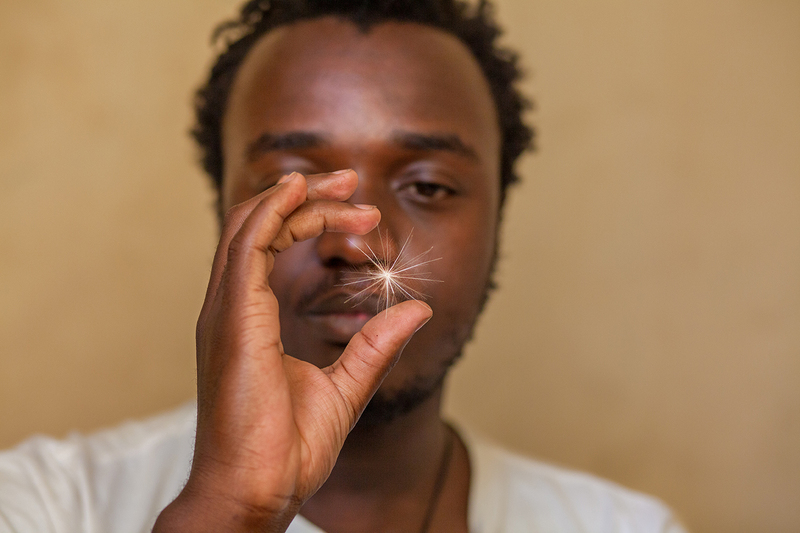 For instance, Msingizi, who’s holding a delicate milkweed blossom in the photo featured on the exhibition’s invitation card, is one case of a young man who stepped back from that fatal choice before making the actual attempt. But of the three people interviewed in her video, only two are survivors. David had already attempted suicide three times before Patricia met him for their interview. He didn’t survive his fourth attempt. The second interviewee, Anita is alive. But when her father poisoned himself, her community attributed his death to evil spirits for which her whole family was cruelly punished. 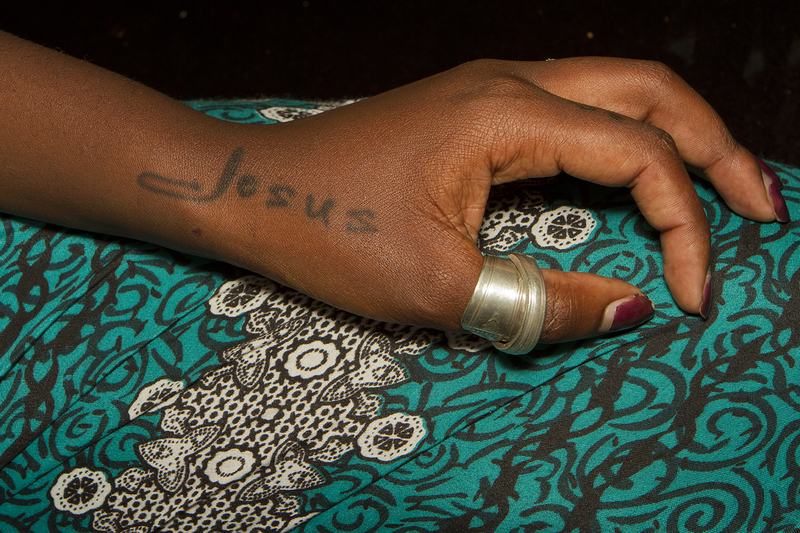 She had to move out of her ancestral homeland and now lives in another part of East Africa. The third survivor is George, a young man who as an LGBTQ activist chose to ‘come out’ and tell the world that he was gay. But depression and loneliness followed. He too survives and stays in a shelter for other LGBTQs. But besides shooting photos of survivors, family and friends, Patricia also has created images inspired by things people have told her of their experience. 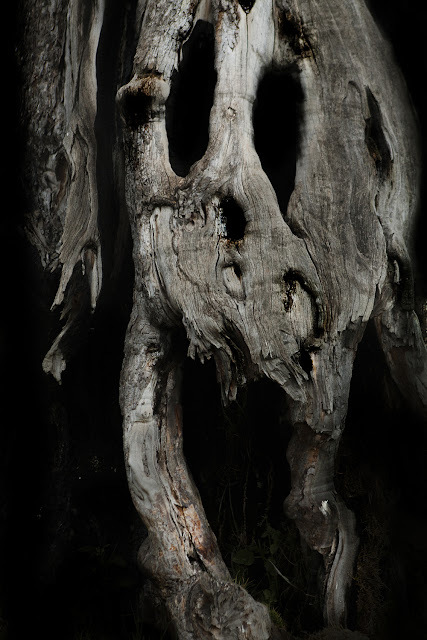 For instance, a dry, gnarled tree branch echoes a description of suicide that one survivor shared. He said it was like “a dark dark hole”, which is what one can see in the image. Another survivor told her she had gone outside to kill herself. 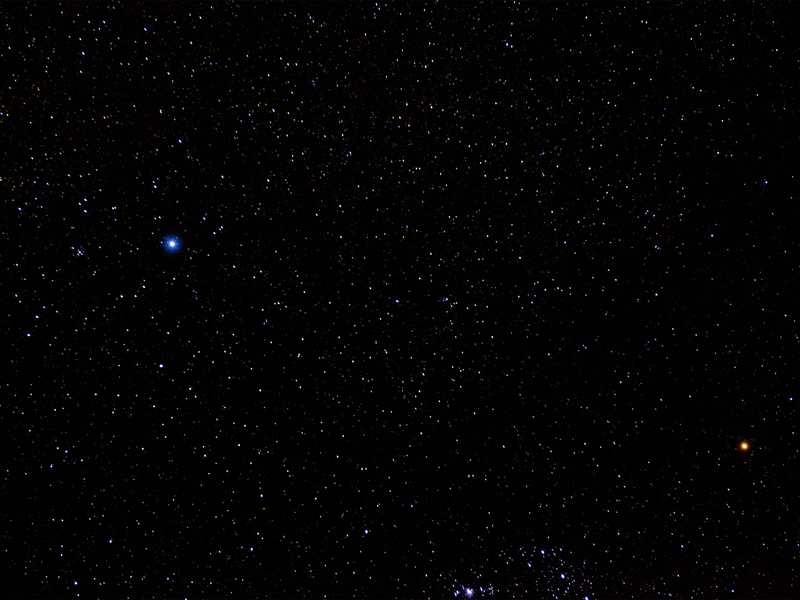 But then, when she looked up at the sky and felt so awed by the stars and the infinite universe above that she changed her mind. 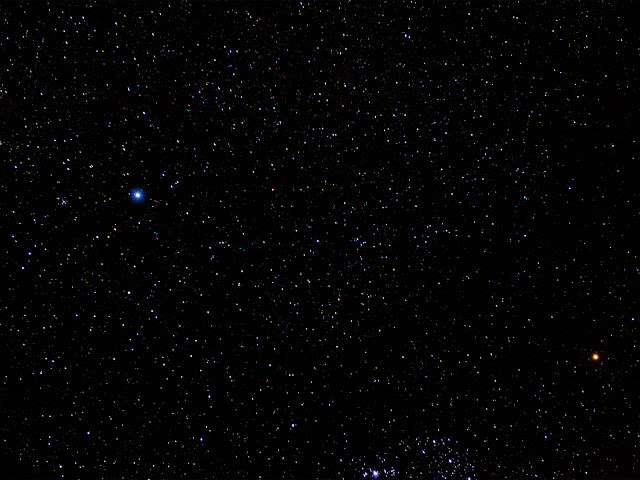 Thus, there’s one starry black sky in the exhibition. There’s even an image of a leafy canopy of trees, which Patricia included because she says several survivors told her that nature had been a soothing presence in their lives. Even the title of the exhibition “Out of this Life” came out of the mouth of one person she interviewed. “In fact, I came to the conclusion that many who attempt suicide don’t necessarily want to die. They simply feel overwhelmed with an intense sense of pressure and want to take a rest. “As one person told me, “I wanted a way ‘out of this life’. I thought that was an appropriate title for this show,” says Patricia who hopes her project will advance a broader understanding of what suicide is all about. “Out of this Life” has been shortlisted for the CAP Prize for Contemporary African Photography, the winners of which will be announced later this year.